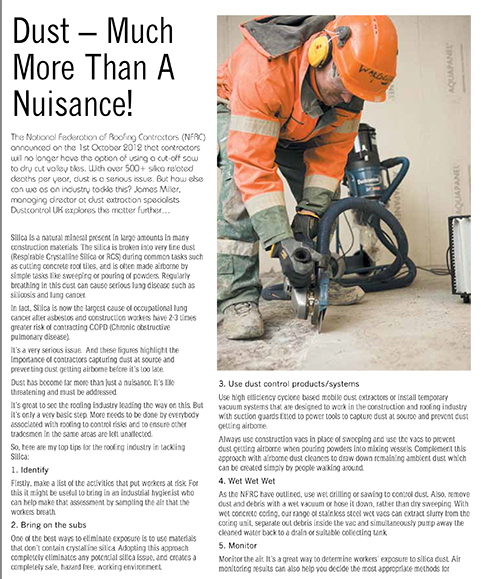 Dust - much more than a nuisance! James Miller, General Manager at Dustcontrol UK, highlights how industries can tackle the issue of hazardous dust. "Roofing Today is the authoritative magazine for the roofing industry. With comprehensive and topical coverage written by industry specialists, Roofing Today is informative and relevant to all roofing specifiers and contractors". Click on the picture to read the whole article in the Roofing Today Magazine.